At the Huffington Post, James Roumell takes up the task of identifying the proper size of government. His answer: “The Proper Size of Government is Big.” He doesn’t just like his government big; he likes it European-style. He asserts that his goal is to put the debate in context, but his commentary studiously ignores all aspects of the debate which do not reflect positively upon larger government size, thus reducing the “context” to nothing more than simple issue advocacy. Moreover, his issue advocacy focuses on just one issue – capital allocation – without even so much as mentioning some of the significant and substantial reasons why proponents of a smaller government take their position. Perhaps that is a reflection of Mr. Roumell’s perspective as an asset manager. However, it is no excuse. If he were writing a newspaper column, where space was at a premium, it might be acceptable, but in a blog format where space constraints are irrelevant, the failure to even address the counter argument when purporting to give “context” to a debate is deficient. Advocates of small government favor restrictions on its size not just on the basis of economic efficiency, but also on the basis of individual liberty. We are concerned about the concentration of power in the hands of a few, regardless of whether such a concentration would be economically efficient. Mr. Roumell asks, rhetorically, “Americans might want to ask themselves if they were forced to choose between reducing the public sector by 15% versus increasing it by 15%, which would they prefer?” But small-government advocates, before getting to that question, would ask “would you, as an American, be willing to live under a dictatorship if it meant a better standard of living?” Undoubtedly, some people will say “yes,” but I suspect that vast majority of Americans would say no (although the number of consents will assuredly increase the greater the economic advantages bestowed). Mr. Roumell does not touch upon this issue at all. Perhaps he has the same problem that a CNN reporter had when interviewing some members of the Tea Party. The Tea Party was protesting the stimulus bill because its members felt that it was wrong and that it was being orchestrated by powerful interests in Washington, while they had no say. The CNN reporter was nonplussed at the protest and tried to explain to the protesters that they would be getting money from the stimulus. She was simply unable to comprehend that it was the method and process – not just the money – that mattered, and that these people were upset on a philosophical level as to how their government was being run, something which was more important to them than immediate financial gain. Of course, one can take the position that the Tea Party is foolish for doing so, but it at least must be recognized that economic outcomes are not the only things that are important to citizens when they choose a government. A corollary to this point is that many people who advocate for smaller government are concerned not with its overall size, but its composition and power distribution. For instance, smaller government advocates often are in favor or a robust military, police force and judicial system. They also tend to favor institutions that are controlled at a more localized level. So, PTA boards “yes,” the Department of Education “no.” The size is important, but what is more important is the level of intrusiveness and the loci of power. Mr. Roumell either considered these arguments and rejected them out of hand or failed to consider them when constructing his column. Neither was appropriate. Philosophical arguments aside, Mr. Roumell’s economic efficiency arguments are, overall, weak on their own terms. Aside from his observation that that the OECD countries spend a high percentage of their GDP on the public sector, most of the points he makes to support his arguments are ambiguous, at best. Take, for example, his reference to Eisenhower founding NASA and the precursor to DARPA. While NASA achieved great things in getting to space and the Moon, there are many who would argue that the agency has wasted vast sums of money on projects that aren’t necessary or provide little return for the investment dollar. As for DARPA, Roumell likes it because it created the Internet. DARPA is a valuable asset to the United States because it provides a way for the government to invest in promising military technologies that might otherwise go unfunded, but that does not mean the Internet is a great example of big government. Had DARPA not funded the early internet, it would likely have come into being anyways. Students and scientists at university would have fooled around with networking technology until it sprang into existence. In France, the proto-internet was implemented by businesses; it wascalled the Minitel. Another dubious point in favor of big government is the observation that “the wealthiest nations on earth are all characterized by economies with a dynamic and robust public-private partnership.” The same could be said for some of the worst autocracies and kleptocracies in the world, some of which are very poor. Almost all nations seek to implement public-private partnerships. While they are often present in wealth societies because there is money to spend and a rule of law, they are also found in the poorest societies because there is still (the people’s) money to spend, while at the same time the law can be bent to accommodate whatever is necessary. I won’t argue with Mr. Roumell’s point about the superior capital allocation capabilities of the government in certain circumstances regarding long-term health and welfare. Indeed, I think most small-government advocates would agree that the government has a role to play when there is a market failure due to a time horizon beyond the return period in which corporations are interested. However, Mr. Roumell conflates that sort of spending with the benefits of computing that were derived from government defense initiatives, which is a problematic argument for two reasons. First, small-government advocates generally acknowledge that national defense is an area where the government can and should be “large”. Second, while we should always take advantage of any derivative benefits that come from a military or other government program, arguing that we should have a large government in order to create such benefits is silly. The Internet would have come into existence without DARPA. On the other hand, how many programs has DARPA invested in that have led nowhere, with no return to the taxpayer? In the case of DARPA, those negative returns are balanced out by the fact that we need a mechanism to promote early-stage advanced technologies due to their vital role and the fact that the market is unlikely to provide them. Where is the similar justification for spending by the Department of Energy, Education, Labor and others? And how does Mr. Roumell come to the conclusion that small-government proponents are “adolescents pumping their chests to proclaim that they don’t need mom and dad… [a]nd then Katrina, Sandy or Ebola hit and the most ardent detractors, and often their Republican Governors, come crawling to Uncle Sam asking for help”? The examples he cites are all in areas where the Republicans have no issue with government – emergency and disaster relief and threats of bodily injury to the American people. Mr. Roumell does cite successes by the EPA and FDA In the areas of pollution and drug safety, but he fails to mention the enormous economic damage the EPA has inflicted on industry – sometimes capriciously – with many of its rules, or the people that have died as drug approval has lingered at the FDA. For all the good that Mr. Roumell cites at these agencies, there is much damage done by them. I’m a committed private-sector loving guy who invests capital for a living, so why the appreciation for the public-sector? For one, I’ve seen first-hand for nearly 30 years how private allocators of capital often get it terribly wrong, too. In 2011 Hewlett Packard bought Autonomy Corporation, PLC for $11 billion and in 2012 wrote off $9 billion. Oops. In fact, perennial corporate write-offs from over paying for acquisitions are routine in the private sector and in each instance represents a poor capital allocation decision. This is the most troubling part of Mr. Roumell’s argument. He shows no appreciation for the difference between state and private action. Investors in HP or another private entity, are able to enter and exit their position at will. HP can exercise no control over their decisions, and the shareholders’ losses are limited to the stock that they voluntarily purchase. When the state acts, it is a different matter, entirely. Citizens cannot simply opt in and out of the country’s decisions. When a poor decision is made by the government, the citizen is tied to it, for better or worse. Furthermore, unlike in the case of the private company, when decisions are made at the federal level they are done so by people that the citizen has never heard of and never voted for. There may be many smart and wise people in government making good decisions, but nobody who has thought about these issues should make the mistake of thinking that decision made by the central government are similar to those made by private companies or individuals. It is not a matter of degree, it is a matter of kind. Mr. Roumell concludes his column by claiming the Republic Party has been hijacked by “government haters.” Undoubtedly, there are some. However, disagreeing with the breadth and scope of our current government, and the way in which it has strayed from the idea of federalism and limited government is not reflexive hate, it is the result of study, both at a philosophical and a practical level. When government grows more concentrated, it grows more powerful and the rights of individuals recede. When government grow more concentrated and powerful, it makes it easier for well-connected and powerful interests to exert even more influence. And, when government becomes concentrated, it enables people to abuse their power far more easily. At an operating level, governments are often inefficient. They are inefficient because they sit at the center of a market inefficiency, monopoly, and thus are not subject to the corrective force of competition. If we want to have a discussion about the proper size of government, then any “context” must include all of the ways in which government has wasted money, been subject to abuses of power and makes decisions based on the furtherance of political interests, rather than objective criteria. Context requires a look at both sides of the issue. Hillary Clinton Demands: Show Them the E-Mails! Clinton wants those e-mails released (now, gosh darn it!). Phew, clearly Hillary is honest and straightforward – she want’s her e-emails released just as much as all of the reporters and Republicans who have been clamoring for them the last few days. Problem solved! According to news reports, her staff combed through her e-mails and delivered 55,000 to the Department of State. I have prepared a handy Venn diagram depicting Clinton’s e-mails during her tenure as Secretary of State. As I had no way to show the absence of any e-mails from her DOS account, I have had to settle for an arrow pointing to nothingness. That aside, what do we see in this chart? 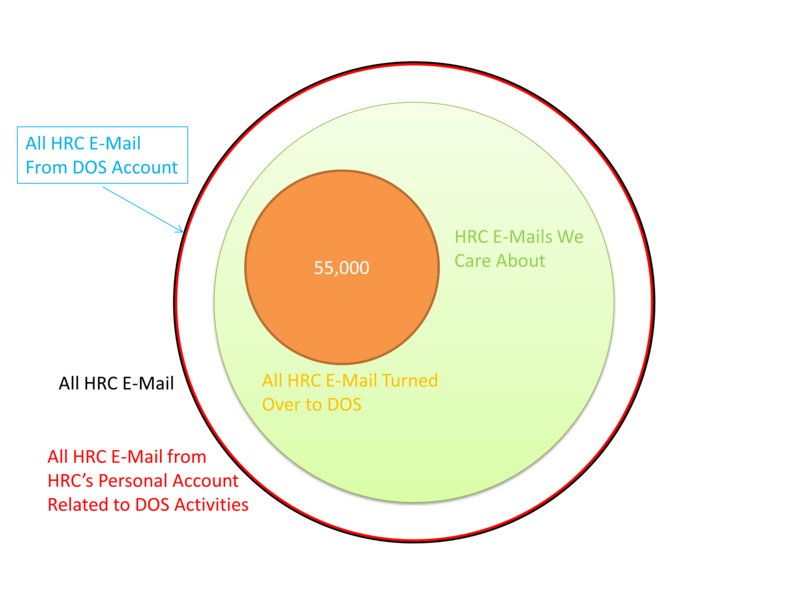 Hillary Clinton has been asked to produce everything in the red circle, representing any and all e-mails she sent in her capacity as Secretary of State. Those e-mails are the property of the American people. Her representatives combed through the red circle and delivered only what they wanted to, represented by the orange circle. We care about what is in the green circle.